Call blocker. Calls blocking is now simple and effective! 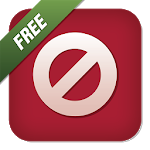 Blacklist Plus is an easy to use call blocker. 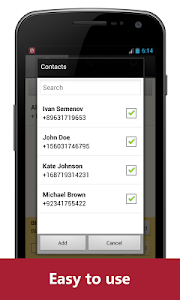 You can add to the blacklist not only any contact or number from the calls and messages logs, but also the whole range of any phone numbers that begin with certain digits. Any numbers in any format, can be added to both the black and the white lists. 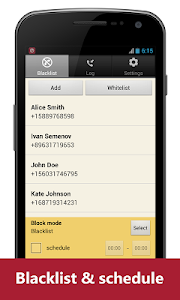 Blacklist Plus is a powerful call blocker. By using the whitelist and the various modes of blocking, you will have the opportunity to define precisely the circle of people who can get access to you. The scheduling option will also let you set the hours you want blocking activated and will prevent unexpected night calls from bothering you. This call blocker also provides a whole range of options for managing the blocking, such as the option to block hidden numbers, as well as the option to turn off notifications and setup password protection (available only in the PRO version). Blacklist Plus is a perfect call blocker that can instantly hang up unwanted calls or simply turn off their sound, depending on what block method you have selected. No matter what your choice is, your phone’s call log will be cleared of all traces of the blocked calls. All the information regarding blocked calls is saved in the app’s log. You will be able to make calls without leaving the program. 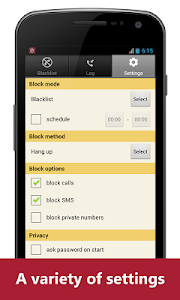 You can also turn off the calls blocking at any time, by selecting the appropriate block mode. If you don’t want others to know about your blacklist and to be able to view the journal of blocked calls, use the password protection function (available only in the PRO version). How to hide status bar icon? You can hide status bar icon by unchecking "show status bar icon" option in the "Settings" tab of the application. App type: Call blocker, Blacklist. FAQ: How to hide status bar icon? Similar to "Blacklist Plus - Call Blocker"